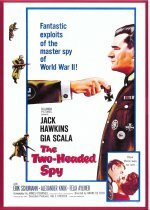 A taut little wartime spy saga, directed by the one-eyed Andre De Toth, with Jack Hawkins as the Englishman who has been planted by British intelligence into Germany since the end of the First World War. By the time the Second World War breaks out, Hawkins has a senior admin job in Berlin and passes information to his contact, a clockmaker, and then to a singer played by Gia Scala. The emphasis is on Hawkins's character and his refusal to become romantically involved with anyone and therefore vulnerable. Kenneth Griffith appears briefly as Hitler, a young Michael Caine exhibits his flair for foreign accents playing a Gestapo agent, and there's also a chance to see British stage actor Walter Hudd, who was cast as Lawrence of Arabia for a Korda project in the 1930s. "Dear Sir, I have recently received the dvd the Two-Headed Spy and I am just sending you this email to say a very big thank you for a job well done. The quality of the dvd is really excellent including the artwork. John C."